U.S. corporate bond investors face challenges when trading bonds on spread due to interest rate risk in the Treasury market. Specifically, any purchase (sale) of a corporate bond on spread needs to be accompanied with the sale (purchase) of a U.S. Treasury to offset the interest rate risk inherent in the corporate bond. The primary cause is time delays that lead to changes in all-in bond yield and costs from embedded Treasury bid/ask. 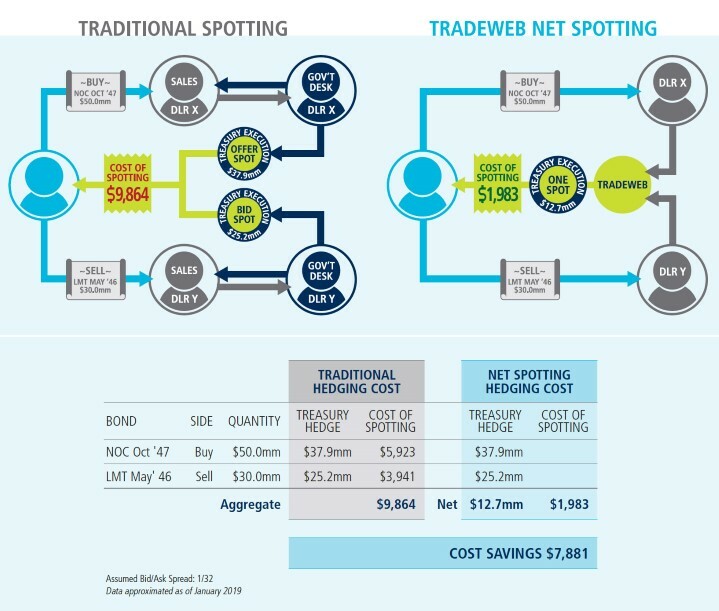 The Tradeweb patent-pending, net-spotting methodology offers a simple, technology-led solution that has achieved significant results by reducing embedded bid/ask costs of offsetting Treasury hedges of spotted corporate bonds. Spread trading, in which a spread is quoted above a benchmark government bond yield, is a conventional form of transacting in investment grade credit markets, offering investors a simple way to evaluate corporate credit risk. However, the hedging necessary to offset the dealer’s interest rate exposure means the trades are inherently complex. Cash credit trades are often spotted on a line by line basis and firms may execute numerous trades and spots daily, leading to significant costs. Tradeweb estimates U.S. Treasury activity on the back of corporate trades may amount to as much as $1.5 trillion annually, based on a conservative estimate that 50 percent of spread-traded corporate bonds have a linked Treasury hedge. The costs associated with spotting are the result of Treasury bid/ask spreads and inefficiencies embedded in workflows. When investors agree on a spread for a corporate bond, the trade is not always spotted against the corresponding Treasury at the same time. When it is spotted, there is often a delay as the trader on the dealer desk phones her Treasury desk to get a price and then execute. Up to a fifteen- minute time lag is common, which can have a significant impact on the all-in price of the corporate bond. On a $1 million 10-year U.S. Treasury spot hedge, the delay represents an estimated $390 of risk based on realized volatility since 2013. The lag creates pricing and execution uncertainty, because as the buyer waits, the price of the Treasury may move. The result is a potential mismatch between the assumed price of the spread trade at the moment of execution and the eventual price paid. “A simple back of the envelope calculation reveals the scale of the problem. If the risk associated with each trade in U.S. investment grade credit markets is even 1 tick2 on average, linking corporate bond pricing electronically to the actual hedge reference prices represents almost $500 million dollars of potential annual risk reduction and cost savings on $1.5 trillion of Treasury hedge volume," says Chris Bruner, Managing Director, Head of U.S. Credit. There are also inevitable additional exposures associated with the bid/ask spread on Treasuries as they are bought and sold. Investors can achieve some savings by executing multiple spots at the same time, but synergies are only available for a single benchmark against a single counterparty. The direct cost of trading is only half the story. The spotting process is also operationally clunky, with firms buying and selling multiple bonds and spotting for different benchmarks through the day. Each trade requires its own set of workflows; spot timing and quality can vary from one trade to the next. There is also little option to shop around—spotting is invariably with the dealer that executes the corporate bond trade. This can impact execution quality of the corresponding Treasury. At a time when swathes of credit trading are going electronic, the stuttering spotting process can feel increasingly outdated. In the face of the challenges around spotting, buy side firms may consider several potentially mitigating measures. The first, and most obvious, is to take steps to manage liquidity better, aiming to achieve the same exposures through fewer individual bonds. In a similar vein, firms can redesign portfolios, increase ticket sizes or execute more block trades. They can also reduce the number of dealer relationships in any portfolio—fewer counterparties means more potential synergy for offsetting interest rate exposure when spotting multiple trades together. In addition, there may be practical ways to make workflows more efficient, essentially filling the gaps created by spotting so there is less dead time and more operational efficiency. Finally, firms may execute more trades electronically, which would speed up spotting in some cases. All of these in theory might make some difference. However, in practice there are challenges. For example, there are numerous tools to help manage liquidity, but a strategy led by liquidity rather than credit selection is likely to increase tracking error and steer investors away from their mandates. In addition, it’s not simple to redesign portfolios to target lower ticket counts, especially given limitations on bond availability and the potential price impact of large trades. Cutting the number of dealer relationships, meanwhile, may be counterproductive in a liquidity-restricted environment. Workflows may be adjusted, but streamlined processes by themselves will not significantly reduce hedging costs. Finally, electronic trading is only part of the story in corporate bond markets, as voice trading still represents a majority of U.S. corporate bond volume. Inefficiencies in credit spotting markets increase costs and are resistant to obvious tweaks to trading patterns, workflows or relationships. However, technology provides an alternative approach. A new, exclusive Tradeweb solution aims to address the challenge through an automated process of aggregation and netting of Treasury spots that can be applied across a firm’s corporate bond transactions and relationships. The solution starts with an application that leverages the Tradeweb marketplace to fully automate the spotting process. That means that buy side traders no longer need to wait for a Treasury quote, reducing the chance of slippage and freeing up time to focus on value-add and portfolio construction. The process also provides tangential benefits: streamlined workflows, for example, enable much simpler production of pro forma audit trails. Automation also benefits liquidity providers, allowing them to immediately offset interest rate risk. “Both buy- and sell-side parties reduced their execution risk by shortening time to quote, whereas historically, movements in the Treasury market while waiting to spot a trade could have a significant impact,” says Greta Flaherty, Director, U.S. Credit Dealer Relationship Management. The second part of the solution adds another layer of efficiency, this time through automated multilateral net spotting. It automatically collects electronically-processed and fully-electronic trades and calculates net interest rate exposure to each treasury benchmark from the accompanying Treasury hedges. This produces a net position, which the firm is able to spot through a single transaction for each benchmark tenor. Using Tradeweb’s proprietary algorithm, all dealers with whom the investor has traded bonds on spread against a given benchmark security during the period, are allocated their appropriate Treasury hedges via the Tradeweb platform. The price is based on Tradeweb Treasury Composite prices, which is derived from contributions from over 20 leading dealers. Tradeweb provides all the infrastructure, and the netted spot can be executed at designated moments through the day, rather than after each trade. Rather than spotting based on the side of the corporate trade, thereby increasing the price of the buys and decreasing the price of the sells, the client receives a single spot price for all trades against a given Treasury benchmark security. Net spotting is a step change in the operational efficiency of credit markets, enabling buy-side and sell-side firms to save money and boost process efficiency. By aggregating multiple hedging trades in a single transaction, firms are able to reduce the costs of multiple bids and asks through the day. Full automation means there is a low chance of transaction failure. In addition, firms can optimize the frequency of their spot- hedging activities over time, based on the number and characteristics of their trades and their portfolio requirements. In one simple example of the process in action, an investor buys $50 million of the Northrup Grumman 4.03% Oct 2047 bond from Dealer X and sells $30 million of the Lockheed Martin 4.70% May 2046 bond to Dealer Y, and the current bid/ask for the 3.00% Aug 2048 old 30-year Treasury Bond is 100-02+/100-03+. Under the old workflow, Dealer X would hedge the Northrup Grumman bond she sold to the investor by buying $37.9mm of the old 30-year Treasury Bond at a price of 100-03+, with the cost of the hedge (1/64th for each $100) being passed to the client. Similarly, Dealer Y would hedge the Lockheed Martin bond she bought from the investor by selling $25.2mm of the old Treasury Bond at a price of 100-02+ and pass the full cost of that hedge to the client. In effect, the client has paid full bid/ask (1/32nd) on $25.2mm old Treasury Bonds of interest rate risk that would net out from her perspective. Using the Tradeweb patent-pending net spotting technology, the client can have both trades spotted at the same Treasury price and only be charged the net interest rate risk on $12.7mm old Treasury Bonds. This would result in a savings of almost $7,900. Tradeweb ensures that each dealer is allocated the full amount of their Treasury hedge at the net spot level used to price the corporate bonds. By fully integrating Tradeweb’s robust U.S. Treasury market into the net spotting tool, and linking the hedge level to the corporate bond reference level, liquidity providers are not exposed to interest rate risk when the trade is spotted, while the client benefits from significant cost savings. Additionally, the client saves time and creates operational efficiencies. In particular, under the old system, the positions probably would have been aggregated over a period of time against multiple dealers with different legs being spotted at different times with different composite Treasury prices. Now all the spots occur at a single moment against a single dealer. Net spotting works for bonds traded under multiple protocols on the platform, including electronic RFQ, Blast A2A, and electronically-processed trades. Furthermore, net spotting is also available with the recently launched portfolio trading capabilities on Tradeweb. Net spotting has already proved popular among Tradeweb clients. Just six months after roll out, almost 10% of Tradeweb electronically-processed volumes were being executed via the methodology. For a client executing $100 billion of risk annually, this would mean savings upwards of $3.7 million based on a conservative estimate that 20% of the flow is being netted.3 Tradeweb estimates clients have saved over $2.8 million since launch3, with the most active traders realizing significant cost savings. With over $1.5tn in annual U.S. Treasury activity, clients are only beginning to realize potential benefits.